^ Quinones, Sam (July 28, 2011). 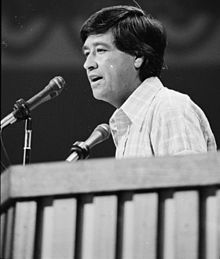 "Richard Chavez dies at 81; brother of Cesar Chavez". Los Angeles Times. Retrieved July 30, 2011. ^ a b c Flanagan, Caitlin (July – August 2011). 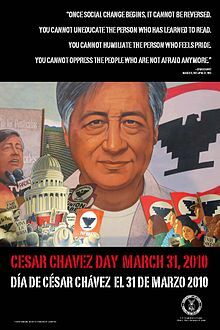 "The Madness of Cesar Chavez". The Atlantic. ^ Pawal, Miriam (January 10, 2006). "Decisions of Long Ago Shape the Union Today". Los Angeles Times. Retrieved September 3, 2018. ^ Hudock, Barry (August 27, 2012). 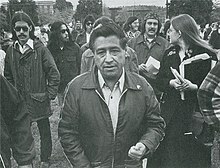 "Cesar's Choice: How America's Farm Workers got Organized". America. Retrieved December 4, 2017. ^ O'Brien, Matt (March 28, 2015). "St. Cesar? 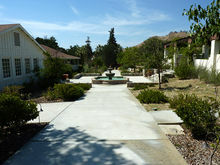 San Jose leaders propose Catholic sainthood for farm labor leader". Santa Cruz Sentinel News. Retrieved December 8, 2017. ^ "Navy To Christen And Launch USNS Cesar Chavez On May 5". KPBS. May 3, 2012. Retrieved October 17, 2012.